A heavy metal band from Amsterdam, playing a unique mix of styles. “Oldschool heavy metal with their own new age touch”. The band started recording their own material and released their first E.p. in 2008 and soon appeared live for the first time in a sold out Volta in Amsterdam. 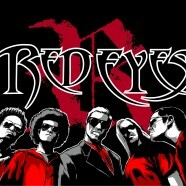 Red Eyes then embarked on a series of gigs throughout Holland, including famous stages such as the Melkweg, Paradiso, the P60 in Amstelveen and did some outdoor festivals such as Herrie in Schiedam 2009/2010 and BITE festival. March 27th the band released their first full-length called Obey The Beast in a sold out Paradiso. Recorded at Soundlodge studios(Germany) home of bands like Dew Scented, God Dethroned, Izegrim a.o. Produced by our own Yordi Lopez and mastered by Darious van Helfteren(Judas Priest, Revamp, Kyteman a.o.). for Concedo Nulli. The result: independent deathmetal.